When you have a great day you should acknowledge it…appreciate it…and share it to make the moment last. It’s like the glide of a paper airplane. There’s the initial trajectory and distance, and then little gusts of air create some unexpected happy loops to extend its trip. Saturday was one of those great days. My “baby girl” got married! It’s not like zero went wrong, it’s that so much went right, the “wrong” just didn’t count at all. It starts at the top with two great people finding each other, and falling in love. (Sure, there are lotsa great people who meet and mesh, but I’m not related to most of them.) Then there’s the proposing and accepting, then the planning. The planning. The months of planning. Why do we say a couple is “getting hitched,” then work so hard to make sure every detail comes off “without a hitch”? With everything that can go sideways, it’s amazing people do it. • Dad (me) did not trip (himself or the bride) while walking down the aisle. Everyone arrived at the altar in vertical position! • The officiant (fantastic Uncle of the Bride) gave a wonderful encapsulation of the entire romance from first date to wedding day. • The vows (written by the couple together) were insightful and funny and uniquely true to the bride and groom. • The ceremony and reception on the Columbia River was picture perfect. Thanks, Gorge-ous Weddings! • The most beautiful view was the stunning bride! (Oh, and the fabulous groom.) Maybe it’s cliché, maybe it was the 4 pm wedding, maybe the 90° heat, but together? They were radiant. I was happy to be part of the toast/speech portion of the reception. 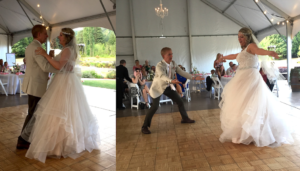 I wrote a few lines for this amazing day, and can report that both my jokes and fatherly wisdom landed well with this special “audience.” When I think about all the good food and once-in-a-lifetime dance with my daughter, the perfect moments just kept piling up. At the risk of being sappy, the beauty of love speaks as loud as anything I’ve ever heard, and having my beautiful daughter be a part of it with her wonderful groom, well, I hope it was and remains one of the best days of their lives. I know it will always be one of the best days of mine. First congratulations to the bride and groom. Your daughter looks happy and beautiful, ready for a real experience with love. Remembering my son and daughter-in-law’s wedding, it is just one of those glow moments for the entire family. Almost like love is bouncing off kisses to everyone from cheek to cheek with the special elation only Iove can bring! I’m very happy for all of you and that such a sweet day was brought into your life. Best wishes for new couples marital bliss, and endless memories. Life is good…very, very good. Steve — tears of joy and happiness came over me in reading your blissful story. Just adored it! Wow–I’m so happy for you and everyone who was a part of this special day. I have not experienced this type of bliss yet(except for my own wedding day) but after reading your version–I know it will be something to behold and not “wash, rinse and repeat” in the least. Can’t wait!! Thank you for sharing such a personal moment with us all. I’m honored. And, I felt the love. I felt your glow shining on me as I read your story (blog). What an amazing day and congrats to the newlyweds and what is to come for them. Cheers!